Above are the scarlet almond toed heels I found at CATO'S on sale for $11.00!!! 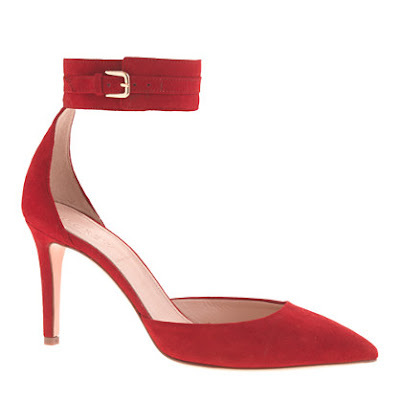 Below are the heels from J.CREW that I love oh so much with a price of $278.00 I could do without! Of course you can get an extra 30% off of that $278.00 when you buy them online for a limited time Here. No, the quality in materials and craft are not on the same level but I think I'll live! I can't wait to style these babies!!! The next thing I'm loving are the sunglasses my sister Megan gave me recently! I haven't worn them yet since its only rainy when I go out these days! They have a slight cat eye that I adore and even though they are over sized they don't sit on my cheeks! As for the lip color I'm wearing it's the same one I mentioned in Howdy! I bought this at my local ULTA! It can be a little messy if you don't blot after use! I wear it two different ways! First as a stain by applying one coat and dabbing off any excess. Second by applying it once, blotting and applying another thin layer over that! Happy First day back at school everyone who's going back this week! And happy monday to everyone else!